Save that old suitcase! 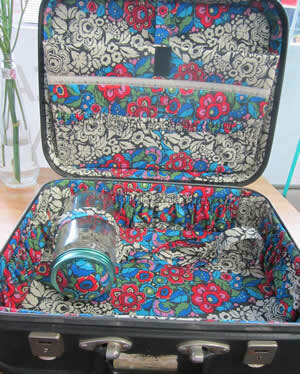 Recycle a hard-sided suitcase and re-line it with colourful fabrics. Barbara will teach you how to line the case, make pockets and insert straps. Tailor it for your own needs and reinvigorate something old into something new. It’s in the bag! Please note that the date for this event has changed from the printed guide and it is now on Saturday 30 May. A hard sided suitcase of any size, similar style to our sample. 1.8m fabric. This will be cut along the length so any design needs to go across the fabric. 35cm decorative ribbon or trim if wanted. Sample used a tape measure ribbon. Sewing machine in good working order, oiled and with a new needle. Items you would like to go into the case so pockets or straps can be made to fit. Nancys Stitch Studio - 261 Thorndon Quay.